How we eliminate WordPress stress and free you to get stuff done. Being the big dog, WordPress is always the target of attack. So, Chuck Norris handles our maintenance and security. Well, pretty much. Sometimes stuff just happens. When it does, our friendly team of WordPress maintenance experts will get you back in action. Every SkyrocketWP plan includes a page load speed guarantee. If your website isn’t immediately faster, we’ll promptly refund your first month’s payment–no questions asked. Choose your rocket. After checkout, we’ll grab your domain registrar and WordPress login info to begin the migration & setup. When it comes to your security, we’re not interested in reactivity. We’re committed to proactivity. If there’s reason to think your site may be infected, we collect enough intel to make the CIA jealous. If your website gets hacked, we’ll work 24/7 to restore the digital home of your business ASAP. ** Currently hosting with Kinsta? Click here. (1) Time really is money. Who has the time to make sure WordPress, your theme, and all your plugins stay up to date? And who has the time (or the know-how) to get things back in order when something goes wrong? And here’s the deal. Those hours aren’t making you money. They’re costing you money. And for what? To save a couple of hundred bucks per month? Sign up for the Saturn 5, connect the lead generation/email opt-in tool to your email marketing software, and create a sales funnel for your business. Or take a social media marketing course and learn to use your social media analytics and management tool (Saturn 5 or higher). Or brainstorm 5 potential clients to cold-call and/or send targeted emails. Just do something that will make money and grow your business. From our own experience, that’s time much better spent than worrying about whether your website is live, healthy, and secure. We gotcha covered on that. At nearly 30% market share, WordPress is far and away the most widely used website content management system (CMS) in the world. As such, it’s developed for more broadly than any other CMS, which makes it (in our opinion) the ideal platform for business and blog websites. The drawback? As expected with the big dog, WordPress is targeted by hackers more frequently than any other CMS in the world. That’s why we built SkyrocketWP on the rock-solid Google Cloud Platform and have implemented security measures that have kept safe the 100+ websites we manage for the duration of their time with us. No one waits on a slow site. Not us. Not you. Not your clients. In fact, half of your should-be clients will be frustrated after just 2 seconds and they’ll abandon it altogether after 3. So, one second can be the difference between earning a client and (functionally) funneling them to your competitors. In other words, if a live, healthy, fast, secure website is important to you, then you need a WordPress maintenance service. Freedom to add multiple websites by utilizing WordPress multisite (let us know and we can set that up for you). In addition, you’ll have sFTP access to your server and 24/7 access to the most helpful support team on the planet. It’s seriously a no-brainer. WHAT ARE THE TECH SPECS OF YOUR HOSTING? WE GET A LOT OF TRAFFIC. CAN YOUR HOSTING BE SCALED TO MEET OUR NEEDS? With 49 active plugins, analytics tracking codes, and several resource-heavy ad scripts, the site loads in just 927ms. According to Pingdom, that’s faster than 90% of the websites they’ve tested. If you want to beef up your hosting, contact us for a custom quote. HOW GOOD IS YOUR WEB HOSTING? There is a lot we could say about our hosting, but the simple fact that your website will be hosted on the same server we entrust with our own entirely web-based business says all that needs to be said. But just in case it doesn’t, SkyrocketWP hosting is built upon Kinsta managed WordPress hosting, the same platform that hosts Coca-Cola, HTC, Evernote, and Sony Music. HOW DOES THE PAGE LOAD SPEED GUARANTEE WORK? If your site on SkyrocketWP doesn’t earn the fastest speed out of 5 consecutive speed tests against your current host, then we’ll promptly refund your first month’s payment–no questions asked. (1) We’ll use Pingdom to run 5 consecutive page speed tests on your website before we migrate it. (2) Then, we’ll run 5 consecutive page speed tests on your website after we migrate it. (3) If your post-migration website doesn’t have the single fastest speed out of all 10 (total) tests, then we’ll refund your first month’s payment. Of course, that doesn’t obligate you to cancel your subscription. But you’ll get your first payment back nonetheless. Yes! And that’s not hypothetical. We actively host, maintain, and support a number of WordPress multisites. DO YOU SUPPORT E-COMMERCE SITES? Yes. While we support all WordPress e-commerce platforms, we specialize in WooCommerce, which is very likely what you’re using. Web hosting issues are supported 24/7 via phone or chat. Non-hosting support is available from 8am-5:30pm CST Monday – Friday. That said, we just don’t get a lot of WordPress maintenance support requests. Our sites tend to rock along at optimal levels, which empowers our clients to run their businesses instead of flushing hours submitting support requests. 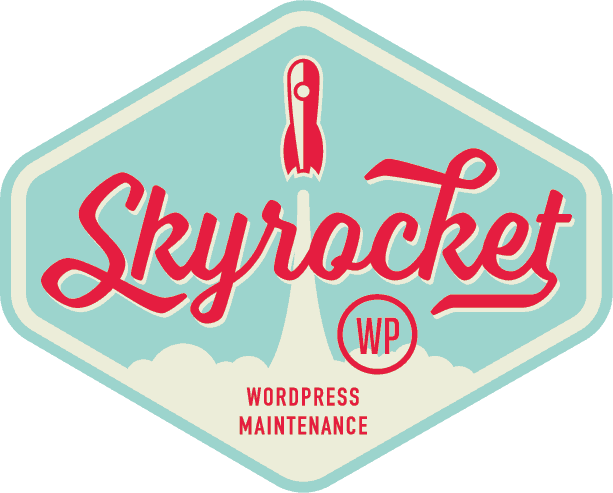 Backup and restore is a staple of the SkyrocketWP WordPress maintenance service. We keep up to 2 months of daily backups to which we can restore your site at any point. We monitor the security of your site in real-time. If your site is hacked, then we will immediately begin work to repair it. If the repair doesn’t work, we will restore a backup of your site from within the last 24 hours and work to harden your website against future attacks. IF MY SITE HAS MALWARE BEFORE I MIGRATE TO SKYROCKETWP, IS MALWARE REMOVAL INCLUDED? If your website has malware before migrating your hosting to SkyrocketWP, it’s removal is not covered under your agreement. In that case, we recommend a service like Sucuri, which has an excellent support team and a track record of getting the job done. We accept any credit or debit card.